Mozart’s 16th Sonata is very popular – I’d be surprised if you’ve never heard the tune before – and it’s also one of the first Mozart sonatas a piano student will attempt, after getting through all the sonatinas (which are like mini sonatas). Mozart’s K545 is at a grade 8 level, so it’s fairly challenging. Today’s video isn’t a tutorial how to play it, but if you’re interested, I’ll link the sheet music so you can learn it. If you’re interested in learning more about Mozart and his fascinating life, check out A Brief History on Mozart, as well as The Music of Mozart. There are a ton of piano sonatas out there. Piano sonatas make up a large part of Classical and Romantic pieces that we learn. But for many of us, the word “sonata” is fairly blank, devoid of specific meaning. 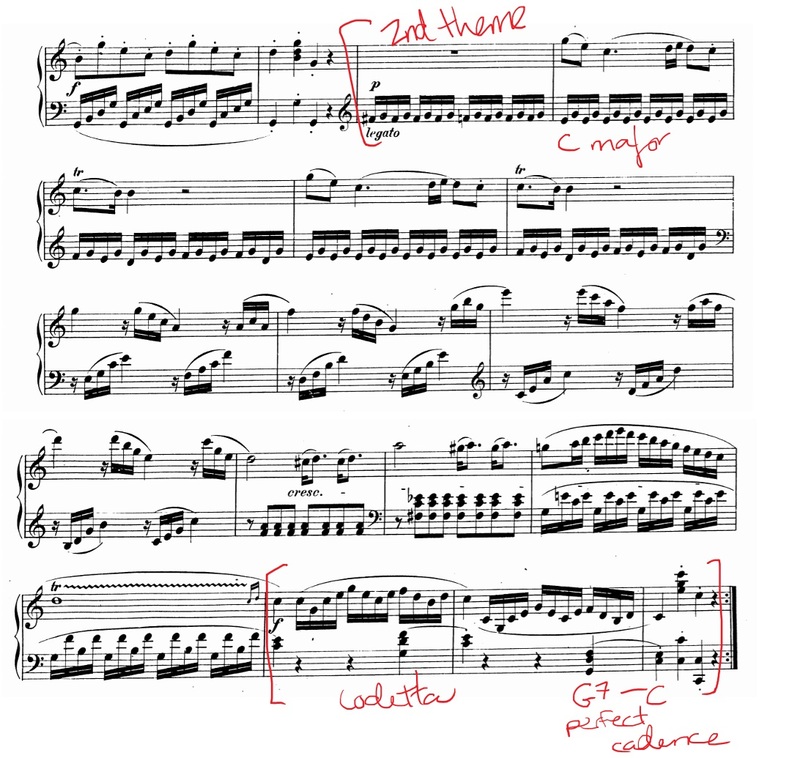 So first, let’s get down to basics: What is a sonata? Sonata form is a specific structure for a piece. This structure has three main parts: Exposition, development and recapitulation. So let’s look at those two answers in more detail. When we say something like, “Sonata no. 16 in C major” by Mozart, we’re referring to a type or genre of song. Sonatas have 3-4 movements. 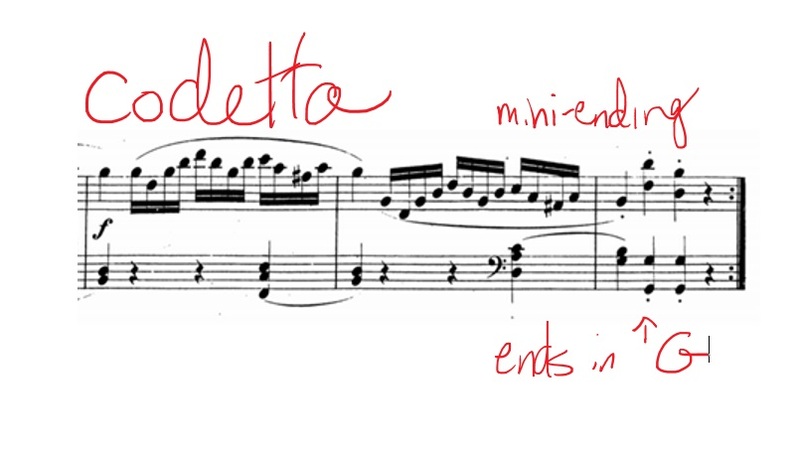 Basically this means that a sonata is made up of a few different mini-songs. Think of it like an album. A regular pop album has about 10 songs, and runs around 30 minutes (3 minutes per song). A sonata runs anywhere from 15-45 minutes, and has 3-4 pieces (5-10 minutes per song). We’re going to be focusing on the first movement today (allegro), because that movement is written in sonata form, which brings us to #2. Obviously that’s super basic, but you get the idea. In pop, the “chorus” is the main idea of the song, and it’s usually the part that repeats the most. It usually has the same words, too. The verses are usually softer, with different lyrics, but the tune stays similar from verse to verse. The bridge is a part of the song that’s completely different from the other parts, and usually serves to build up to a big and loud final chorus. Sonata structure, though pretty different from pop structure, makes more sense once you understand that popular music is generally based on pre-existing structures. It worked the same way in the 1700s and 1800s too. Sonata form was like the pop form of back in the day. Recapitulation (think “recap”. A return to the main theme(s)). So let’s start by looking at the exposition of Mozart’s K545 sonata. The exposition is where the main idea of the piece is heard. It’s kind of like the “chorus” in pop music – it’s the part that’s going to get repeated a bunch (as well as twisted-up and manipulated later on). But it’s not quite as simple as that. A basic sonata exposition generally includes not one but two main themes. And those themes are divided by a transition (kind of like a verse in pop music). The themes are then capped off by a codetta (a mini-ending) that wraps everything up nicely. And usually, once you’ve finished all that, you go back and do it all again. Almost all sonata expositions are repeated start to finish. Let’s take a listen to the first theme of Mozart’s K545 Sonata. This theme is written in the home key (the tonic), which is C major. It’s quite short – just four bars. The transition basically serves as a link between the first and second theme. The second theme is almost always in a different key – usually the dominant, or the fifth note from the original starting key. So in this Mozart Sonata, we start in the key of C major, and the second theme is in the key of G major (the dominant – 5 notes away). 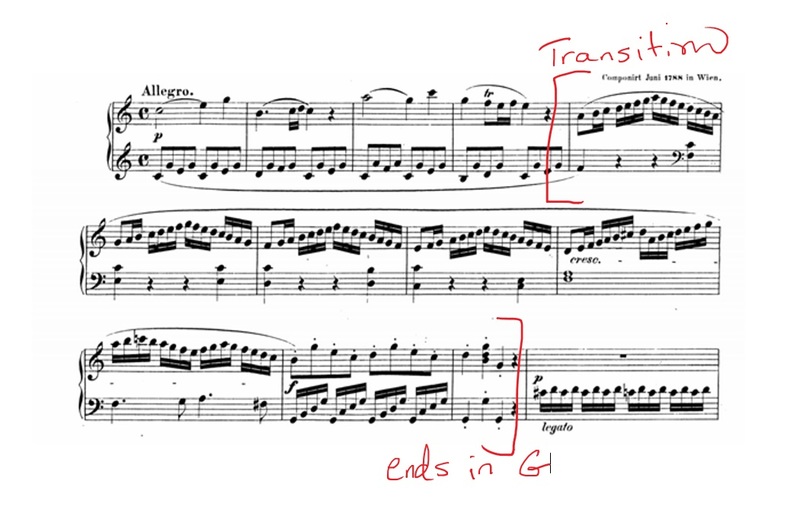 So another point of the transition is to move us from one key to another – in this case, from C major to G major. Mozart accomplishes this by moving our ears through various scales and chords, until he finally lands on a G chord. So now we’re at our second theme in G major. Like the first theme, the tune here is catchy and simple. There are some similarities to the first theme as well, like a fast-moving left hand. The second part of the second theme switches things up to a bunch of arpeggio-like movements. This is similar to the transition, which were a bunch of scale movements. Just another reason to practice your scales and arpeggios, everyone! From there, we do a brief tour of the key of A minor (a natural relative to our original key of C major. See this video on related major/minor keys if you’re interested), ending on a G chord. And then we arrive at our codetta, or mini-ending. It’s just three bars long, and serves the purpose of really solidifying the key we moved to – G major. It ends on a strong perfect cadence, which makes it feel like we’ve reached the end of a paragraph. Then, when we move on to repeat the whole exposition again, the return is immediately noticeable. Mozart, and other sonata composers, aren’t trying to trick us with a repeat. They’re generally really obvious and apparent. So the purpose of the second part of our sonata form, the development, is to really take our two themes and mix them up and make them crazy. 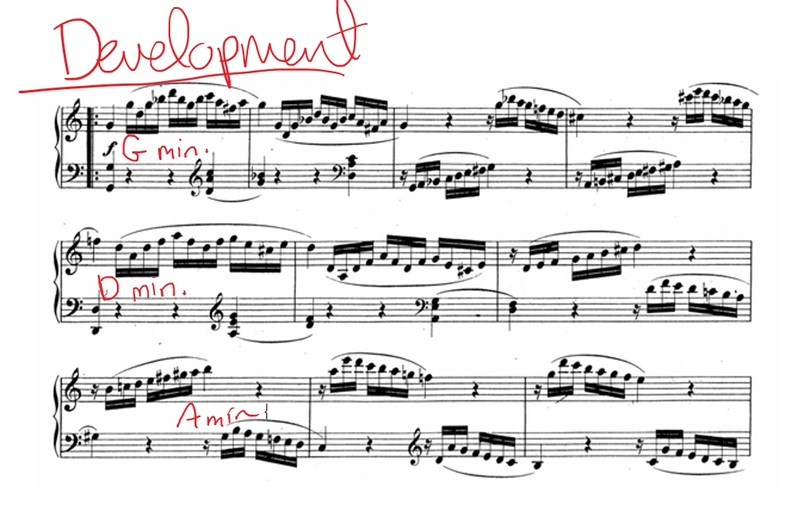 In developments, you’ll see lots of key changing, different rhythms, and sometimes entirely new parts. Developments generally get dark and uneasy. There’s usually a lot of tension in them – they tend to be quite dramatic. Let’s look at our K545 sonata to see what Mozart does with it! The first thing Mozart does here is takes the tune from our codetta, and turns it minor. This is interspersed with scale fragments, kind of like the exposition’s transition. We wander through a few different minor keys in this part – G minor, D minor and A minor – and this leaves us feeling like we’re floating. We’re not anchored in any one key. And beyond that, the keys he’s touring us through are minor, which always feel more uneasy than major keys. Generally, the recapitulation is the same as the exposition, but with a couple of modifications. 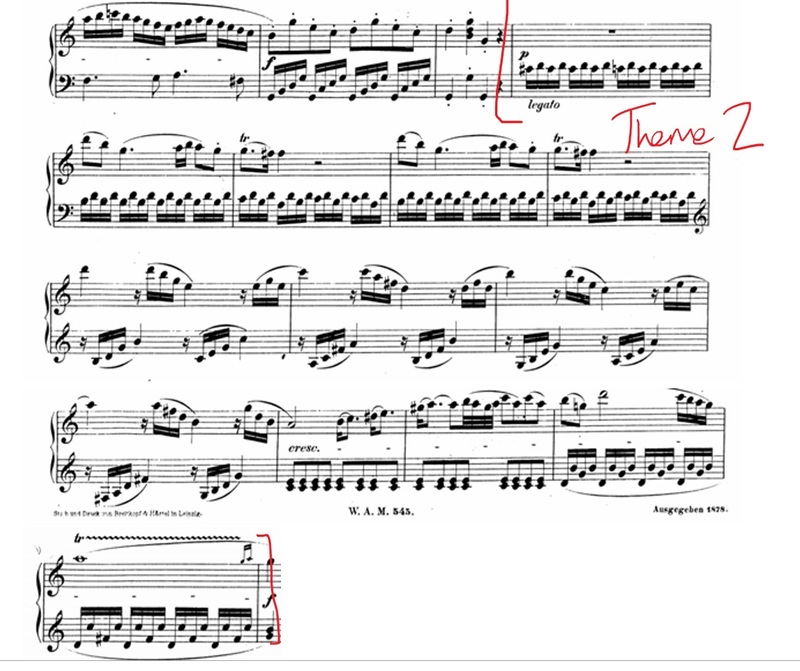 First, instead of the first and second themes being in different keys, composers would have them both be in the same key. 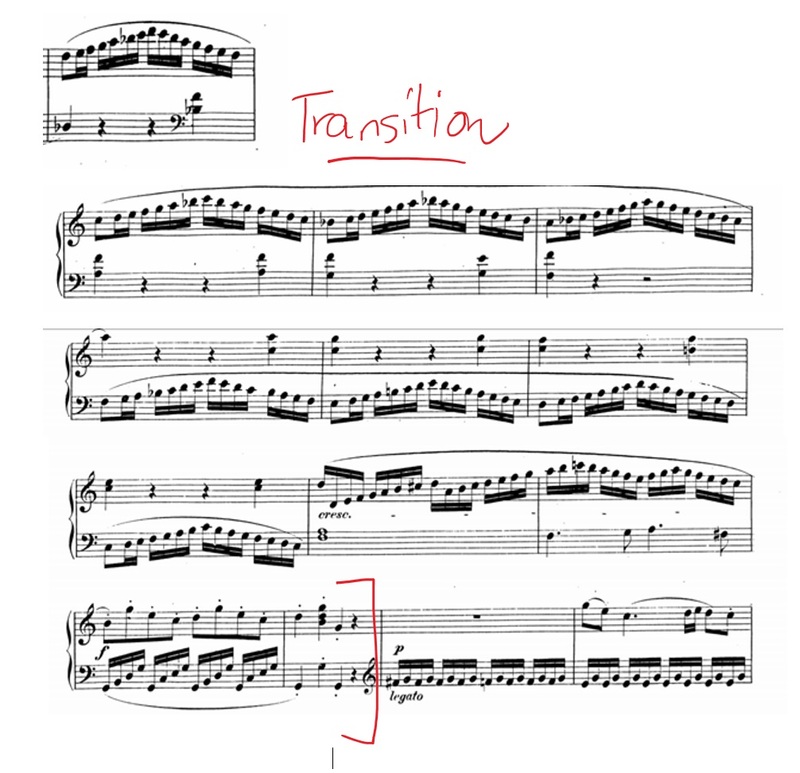 The start of a recapitulation is usually in the home key (this sonata’s home key is C), but Mozart switched things up on us, going back to the main theme, but this time in the key of F major. This was a super rare and unusual thing to do at the time – way to go, Mozart, for breaking the rules! This time, the transition is a little bit longer, because it has to move us from the key of F to our home key for the second theme. You’ll notice a completely new part, but the ending of this transition is identical to that of the exposition. Our second theme is identical to the one in the exposition – the only difference, of course, is that now we’re doing it in the key of C (instead of G like in the exposition). The codetta is also identical (but in the key of C), and we end the recapitulation on a very solidifying perfect cadence. Then it’s time to go back and repeat the WHOLE development and recapitulation! And that concludes today’s video/blog post about sonata form, using Mozart K545 (Sonata no. 16) as our example. If you’re interested in learning more about the entire sonata, a good starting point is at My Journey to Distinction’s blog. For a good essay on the style of Mozart’s sonatas, you can check out Daniel-Ben Pienaar’s site. I hope you learned something today, and I’ll catch you next time! Complete Edition in 2 volumes. Composed by Wolfgang Amadeus Mozart (1756-1791). Edited by Carl Adolf Martienssen and Wilhelm Weismann. This edition: Urtext. Classical Period. Collection (This Edition: Volume 2). With thematic index, introductory text, standard notation and fingerings (does not include words to the songs). 156 pages. Edition Peters #EP1800B. Published by Edition Peters (PE.EP1800B).